dull edges and needles are a money losing proposition in your business. now you can measure sharpness levels, compare & communicate those levels and then manage the cutting and piercing tools you work with! For industry and manufacturing its about quality control and operating efficiencies. For medical suppliers, research labs and hospitals its about better patient care and safer procedures. The BESS, 0-2000 grams, is a linear scale that describes, numerically, how much force is required for an edge or a needle to sever or penetrate a standard test media. Less force equals a sharper edge or a sharper point. When the BESS score for an edge or needle doubles due to operational usage then, so do your problems. 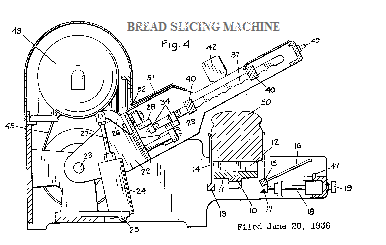 Often, needles and edges are at the very front end of many types of processing and industrial machinery. You don't have to be a physicist to calculate what happens to power consumption and equipment maintenance costs once two or three times times the force is required to do the same job. For every application there is a BESS "sweet spot". The window where operating efficiencies and product quality requirements mesh best. For most, that sweet spot is rarely the sharpest edge but rather the edge or point specifically sharpened to a level that is best suited for the task. For some that number is 120 and for others 720. Edge On Up instrumentation will first help you discover the location and breadth of your window and then, on an on-going basis, used to test, maintain, and refine your assumptions. There is a whole new productivity frontier awaiting you and Edge On Up and BESS have provided you, now, with the tools to conquer it. Join with the many, from axe bits to scalpel blades and meat processors to carpet mills, who have improved their products and their operations dramatically. Then start talking, recording and comparing sharpness numbers within your company- BESS Numbers! The ID75A is the ultimate instrument for precision edge testing and acquires edge sharpness information at lightning speed. 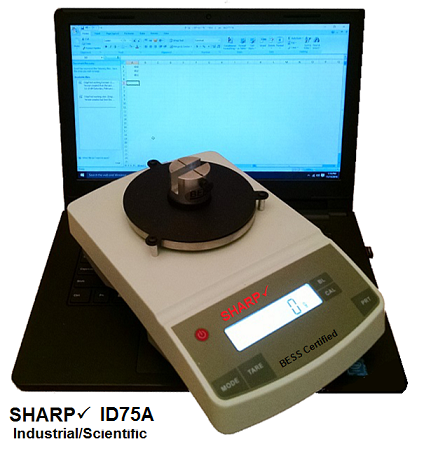 The ID75A has an amazing edge sharpness testing range. From literally a single gram to thousands. file that is capable of logging and time stamping measurement data and communications drivers that can be installed directly on your PC. The ID75A can be set to communicate Com data either manually, when the reading has stabilized, or continuously. The ID75A has one gram of resolution and support loads up to 3000 grams. This instrument measures 7.25" x 10.75" and is 3.5" high not including test fixture. The basic package includes both our Aluminum Test Fixture, pre-loaded with test media, and our Clip Base with 25 disposable test media clips. The ID75A is a true industrial quality instrument and comes with a 3 year warranty. 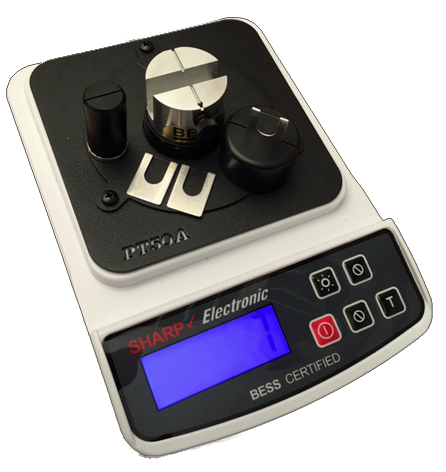 There's plenty said about this handy edge sharpness tester on the home page of our site. The PT50A is the perfect adjunct to our beefier and more capable ID75A. This is the instrument designed to live and work on the factory floor. It's battery operated, smaller, lighter weight and the perfect instrument to measure and help maintain cutting edges on an on-going basis. Many of our industrial customers use multiples of these low cost instruments and at multiple locations. PT50A measurements match perfectly with the ID75A because they both have 1 gram of resolution and both use our Aluminum Test Fixture and/or our disposable clip system. PT50As include a strain sensor system that was designed to stand up to industrial use and are the only PT50 Series instruments warranted for industrial use.